AGEs play a pivotal role in the development of chronic age-related diseases such as diabetes, renal failure and cardiovascular disease. AGEs play a pivotal role in the development of chronic age-related diseases such as diabetes, renal failure and cardiovascular disease. The level of AGEs in long-lived tissues (not in blood!) serves as a memory of glycometabolic and oxidative stress and is a valuable predictor of cardiovascular complications. The diagram below shows how AGEs can lead to the development of vascular complications through 2 pathways: binding to the receptor of AGEs and cross-linking to proteins. The gradual increase or accumulation of AGEs in diabetes causes important blood vessel complications in this disease. In persons with diabetes, there is a higher risk of heart attack and stroke due to damaged large blood vessels. Small blood vessel damage can cause additional complications such as blindness and kidney failure. Many diabetes patients will know that so-called glycated haemoglobin (HbA1c) is used to see if their blood sugar levels are well controlled. AGEs are not the same as HbA1c, because the changes in AGEs are much slower. AGEs are a better predictor of the risk of diabetes, heart attack and stroke. Blood sugar levels and accumulation of AGEs are not the only predictors however. High blood pressure, cholesterol/lipid levels and smoking increase this risk. Information on all these so-called risk factors is very important for your doctor to make the right decisions on starting or changing treatment. AGEs are also externally formed by the heating of food and are taken up by the body. Examples of food with very high level of AGEs are cola and creme brulee. Another source of AGEs intake is due to smoking. The AGE Reader provides an immediate prediction for the cardiovascular risk of your patient. 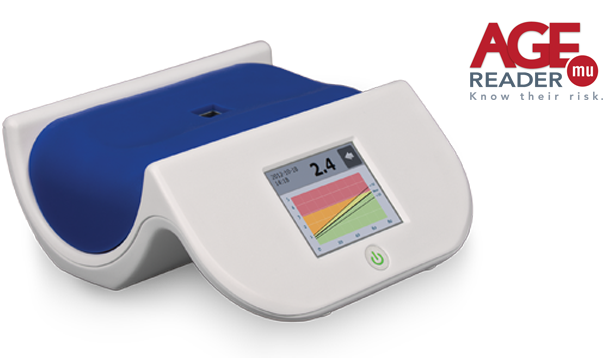 The non-invasive and extensively validated AGE Reader is and ideal tool for point of care testing. The measurement result is available in 12 seconds and can be exported directly.